Sequere 'Follow Adventures in Latin Teaching' epistulā electronicā. Scribe tuum epistulae electronicae titulum ut hanc litterulam sequas et notitiās novārum scribulārum epistulā electronicā recipias. 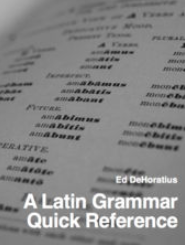 Click here for the Latin Grammar Reference Book in the iBookStore. Click here for my other books on Amazon.